Age 33 Nic passed away in a boating accident while fishing on the Skykomish River. Resided in Seattle Washington. Attended high school at Summit K-12. Attended Renton Technical College and graduated from the Culinary Arts Program. Nic’s main occupation was as a Catering Chef, but he also developed skills in landscaping and home repair. 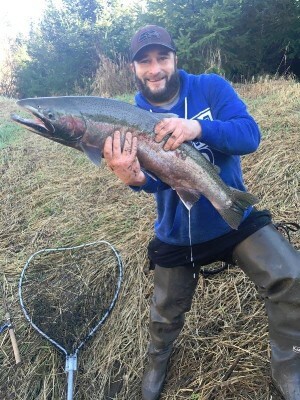 He was looking forward to moving into a different career after being accepted into the Fisheries Management program at Bellingham Technical College, to begin classes this upcoming January. Nic passed away doing what he loved best. He had become an avid river fisherman, in search of the elusive steelhead and salmon. He lived to be out on the rivers of Western Washington, honing his fishing skills. Nic also loved being with his friends and he had many enduring friendships with people of all ages. He was easy to be with – having an endearing warmth that others enjoyed and gravitated towards. In addition to being a champion at the grill and the “smoker” (he loved anything that could be grilled! ), Nic’s gift to the rest of us was being the best and most loyal of friends. Nic will be missed terribly by his family and friends. We have all been blessed by having him in our lives, even for this short time. He is survived by his mother, Diana Gay; his aunt, Debora Gay; and his grandmother, Lucy Gay; extended family, and many friends who feel like family. He was preceded in death by his father, John Dalessio and his grandfather, Robert Gay. A Memorial Service in his honor will be held to celebrate his life (see details below). All who knew him are welcome. I would like to express my condolences to the family and friends of Nicolas Dalessio. The loss of loved ones is never easy. Our loving Creator will one day do away with death and mourning. (Revelations 21:3,4) We have the hope of seeing our loved ones again. May the above verses bring you some comfort. I am so sorry that this accident happended to Nic -- it was such a shock to both me and Patrick when we found out. We are living in Albuquerque, NM -- and found out through a mutual friend of mine and John Dalessio's. My heartfelt condolences to Diana and her family. Nick left us way too soon, I am glad though that he was living his dream. He will be remembered with love. A big hug to you, Diana.